My point is that this technology is definitely here to stay, and you should look into how it can be used in your digital solutions. So what exactly is a beacon? It’s a BLE (Bluetooth Low Energy – the main chip in the badge was the common CC2541 from Texas Instruments) device that sends out (at least) three pieces of data: a (128 bit) unique identifier, a major and minor identifier (number). 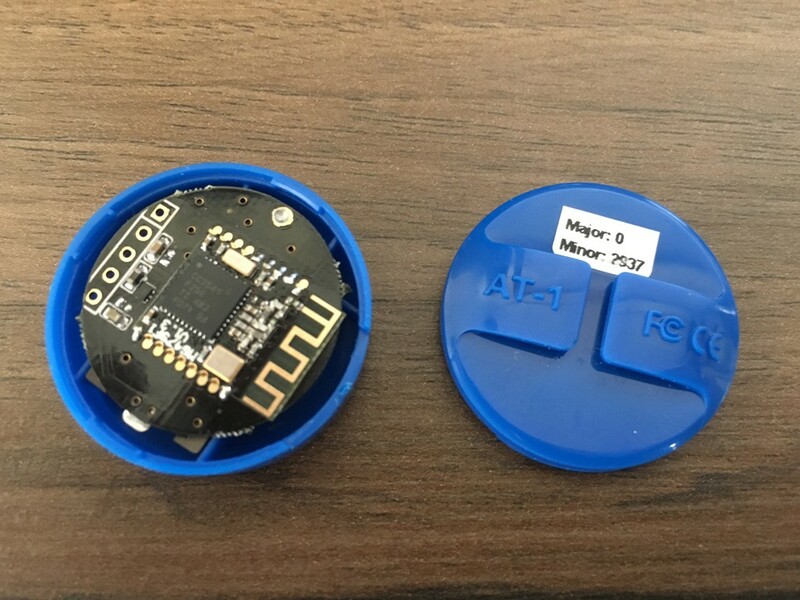 Any device, like a smartphone, with BLE can detect the signal and depending on the strength, it can make assumptions about the distance to the beacon. That’s it! Today almost all iPhones have support for BLE, and about two thirds of Android devices worldwide (BLE is supported on Android 4.4 and above). The obvious example used is in retail, i.e. to put a stationary beacon close to a product in a store, and to lower the installation and maintenance costs, suppliers like our manufacturing client Philips are including them in their LED lights. As GPS is not very reliable inside buildings, with enough beacons, they can be used for indoor positioning with high accuracy (e.g. Estimote Indoor Positioning). Also, as you just learned above, it can also be used to track moving things, like people, but also goods and inventory, as some of our insurance clients are realizing. A nice example was done by Nivea (The Protection Ad), where the beacon was included in an ad with a bracelet to track your child on the beach. As you can see, this is not something that applies to only one sector, all organizations can make use of beacons in their digital solutions. Here is a video on how to build an iPhone app that use beacons. Nice blog, its really nice to read!! Beacons certainly will take over the world. Last week a startup launched the idea to set out beacons out in the public to guide blind people. But also for shopping (personalized digital signage, more product info) or musea, home automation etc. I currently work at Lightcurb and we are trying to make and location based services platform/hub dat enable clients to combine the power of beacons with their infrastructure (personalized digital signage/narrowcasting, personalized lighting depending on the customers that are in the shop). Just two side notes, the Texas instrument chipset is outdated if your in search for an beacon please use te Nordic chipset. The Bluetooth BLE standard is support on Android 4.3 and above ;).